Revisions and widening of Jessica’s Trail this summer, located just off the Stadium, has become a wonderful success story offering adventure and a unique historical perspective. This 1.2km classic-only trail has rapidly become the most discussed trail in our entire network thanks to its twisty-turny, narrow backcountry feel. Don Wylie, Troy Hudson and a slew of volunteer programs kids and adults helped to widen, brush and clear the trail of danger trees and snags this fall. What remains is a wonderful beginner trail for the whole family. The trail is named after Jessica Eaman (26), a club member and former staff member who tragically lost her life in a car accident back in March of 2012. The Jess4Kids Ski Scholarship Fund was created to provide access to Sovereign Lake ski and snowshoe facilities for underprivileged families and cash crunched schools through three regional school districts. The trail is used daily by our S’Cool Ski Programs, with over 3000 kids expected to glide through the trail this winter. Not only has it become popular with kids but more and more adults are including it as an end to their classic ski sessions. “Jess’s Trail provides a great opportunity to fine tune your classic ski skills and experience a true nordic experience just a few short minutes from the lodge“, stated one member. Getting back to the roots of nordic skiing with this style of trail is something that the club is considering more of in the future. “I absolutely love these narrow classic trails, they really bring you back to nature and add a whole new level of mysticism back into skiing that is somewhat lost on wider snowcat groomed trails”, noted Troy Hudson (SLNC General Manager). If you have not had a chance to ski this short trail we strongly suggest you get out there, breath deep and enjoy the surroundings just above the stadium. 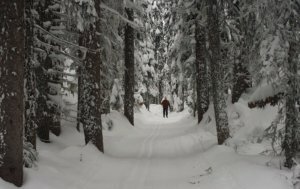 Don Wylie out enjoying early season conditions on the redesigned Jessica’s Trail.